You've got a new buddy! You've made a big step and decided to adopt, and for that we must congratulate you - there's nothing more noble, honest, and kind-hearted than adoption, and the pup you're welcoming into your life is going to be your lifelong friend. Whether it's a tiny puppy or a senior dog that you've picked up, shelter dogs are some of the most grateful creatures in the world. However, such gratefulness sometimes comes after a lifetime of gathering scraps on the street and even surviving abuse, so it's possible that your dog will be anxious and scared when they step into your home. If you want to make them feel comfortable and safe, here are some of the things that you can do. Especially in the first few days. Your dog will probably be nervous; they might even keep hiding from you. They'll be in an unfamiliar place, with unfamiliar people, so you really need to let them adjust at their own pace. Use a soft voice, don't push your dog too hard, and let them sniff out the house slowly. Pet them as often as the dog will allow so they'd get used to your touch, and make sure your new family member knows they're safe here. The fear might make the dog jumpy and nervous, so it's important to give them some space when you notice they're really not up for snuggles right now. Let them come to you on their own terms and don't try to force anything, especially if it's an elder dog. And they will come, we promise. They just need to make sure you won't mistreat them. Show them the house, the yard, and their own little bed. Show them around the neighborhood and places where they're allowed to go potty. If you want to set up boundaries, do it right away - don't let your dog climb the couch now if you won't be allowing this in the future. That kind of thing will only confuse them, so be gentle and show them immediately if you're not okay with something. It's possible that your adopted dog has been "trained" with everything from rolled up newspapers to leather belts. Hitting them or yelling all the time will not only accomplish absolutely nothing, but it's bound to traumatize the dog further and make you feel bad. Some dog trainers, like Liarne Henry from Australia, are proponents of exclusively reward-based, positive reinforcement methods, and research does show that this works a lot better than castigation. For uncertain owners, dog training in Sydney with Liarne is a good way to let the professional handle sensitive dogs, and you can definitely opt for a similar thing. 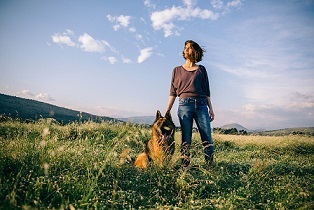 Find a dog trainer around your area, but make sure you pick them based on a recommendation and a good personal philosophy. You don't want your pup in the hands of someone who's going to abuse them all over again. If you're interested in that positive reinforcement research, you can read about it here. When you're introducing your pup to people, make sure you first introduce them to those they'll be seeing often. Your family, and especially your children, need to be on board and everyone has to agree on how the dog will be treated, when they will be walked, how they will be fed, and other practical matters. Make sure the dog is comfortable with the people around them before anyone else is introduced. Snuggle often! That's the best way to bond with your furry friend, so pet them, talk to them, play with them. Spend time together and give them an occasional scratch behind the ear whenever they're around. The dog needs to feel loved, so give them snuggles galore. 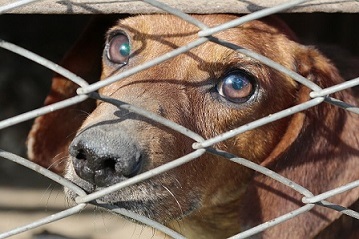 If your dog was previously abandoned, they might get extremely anxious any time you leave the house. a dog trainer can definitely help to ease their soul and control this behavior, but there are some things you can do on your own: leave them with a fun toy to distract them, get them used to spending time without you even when you're in the house, give them a walk before you have to leave them, and make sure you give them a nice treat when you return. Here's more about separation anxiety and how you can help your friend deal with it. It's really all about patience and gentleness. 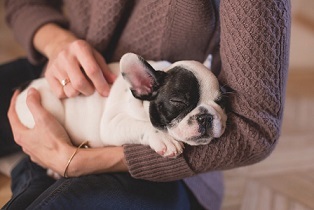 It might be awkward in the beginning, but as soon as your dog adjusts to their new home and their new owner, they'll start settling down and feeling happy. All you need to do is be kind and encourage them on this path. Zara Lewis is a regular contributor at Highstylife.com and a full time animal lover. Passionate about creating a better world for the generations to come, she is a mum of two, raising them inseparably from their furry family members. Copyright © 2018 Barbara Murray. All Rights Reserved.